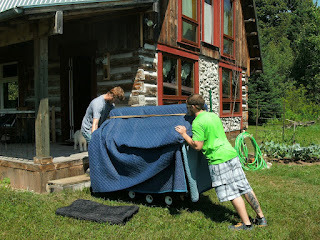 The piano arrived Monday on a truck from somewhere in Missouri, where it had stayed in a warehouse for a night or two. Its journey began in Santa Barbara, California, about three weeks ago. It's my mother's piano, and I was with her when she bought it in Downers Grove, Illinois, probably a dozen or 15 years ago, I don't remember exactly, and neither does my mother. She enjoyed playing ragtime and show tunes, along with a little Satin Doll and Mood Indigo, but my repertoire consists mainly of a little ditty in my head that uses this chord progression: Amaj7, Gmaj7, Amaj7, Gmaj7, Cmaj7, Dmaj7, Cmaj7, Dmaj7, Amaj7, Gmaj7, and so on and so forth. 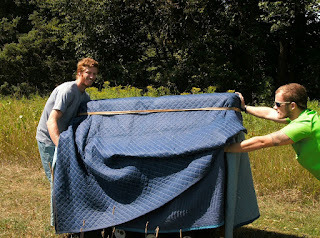 The well-traveled piano is a Charles R. Walter. I think I'll call him Chuck. Southern California to my home in Upper Michigan. Putting my hair in braids for a photo shoot to provide my social media with an up-to-date avatar (say that again???) and to update the staff page of this blog led me to braid my hair throughout the week which led me to notice the scraggly ends of my hair which led me to snip off the scraggly ends of my hair which led me to remember the years of cutting my own hair, short, when I was in my 20s and 30s. I don't recall how that got started, but I do recall some wonderful haircuts that were very short up one side of the head (my left side, if memory serves) and long down the other. (Dang, where are those photos?) My methodology was simple, as I usually just grabbed the scissors and clip-clip-clipped. For a while I tried the technique of flipping my hair over my head, putting it into a barrette or elastic band, then chopping it off. For a while I used an electric clipper, pretty much giving myself buzz cuts accented with the occasional "whoops!" spot. Every few years I might walk into a $15-a-cut place and say, "Whatever you can do. I've been cutting my own hair for years and now it's a mess. Whatever you can do." Then in a few months I'd gather up scissors, clippers, elastic bands, barrettes, the hand mirror, and get back to doing it myself. When I wanted my hair to be long again, like in high school, I didn't know how to go about it. There's always that awkward not short, not long, just crappy hair period that's so hard to get through. Know how I got through it? Some man I was crazy about said: "Your hair would look pretty halfway down your back." So be it. Funny how hard we try and how little it takes. I put the Psychic Beeswax Charmer on Etsy this week and decided I should try one myself, then I could get pictures of it in action and write about it. So one night I asked this question: What will happen if I keep faith in Pea Pickle Farm? I lit my psychic charmer and went about my business. Three hours later I put out the charmer. No sign, yet, of an answer or a charm. The next morning I lit the candle and soon the charm appeared. With my special charm-pickin' tweezers, I pulled out the hands charm. Two hands overlapping. I thought: What the heck does that mean? I forgot about it as I tried to put the charm back in the candle to get the picture I forgot to take, and the whole thing was a fiasco. Forget the pic. But the back of my mind was working. "You know," it said, "that charm really looks more like a pair of mittens, actually gloves, than hands. Face it. It's mittens - I mean gloves. Now, seriously, what does that mean? Do mittens or gloves tell you to have faith - or not?" Yakety yak. Then, like a marching band ten, seven, now three blocks away, I heard the word "joining," over and over, getting louder and louder. Hands, mittens, gloves, whatever the charm actually is, for me it is "joining." I stopped. I listened. It all made sense.